Do you want to know why Orioles fans hate the Yankees? 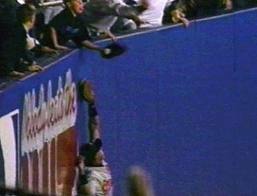 One of the main reasons, for me anyway, is the Jeffrey Maier Incident. It was October 9, 1996 in the Bronx. The Orioles were leading the Yankees 4-3 in Game 1 of the ALCS. In the bottom of the 8th inning, New York’s Derek Jeter hit a drive to right field. Baltimore’s Tony Tarasco raced back to the fence, but 12 year-old fan Jeffrey Maier reached over the wall and pulled the ball into the seats. Umpire Richie Garcia ruled it a home run, which tied the game. Tarasco may not have caught the ball, but it would not have been a home run. Had Maier not leaned over the wall, the ball would have hit the wall; therefore, not a home run. Even the announcers agreed. Baltimore manager Davey Johnson was ejected. The Orioles protested the game, but it was denied. The Yankees won that game and went on to win the ALCS and the World Series. The following year a railing was installed behind the right-field fence to prevent further incidents. Also, instant replay has been brought in to determine home runs.